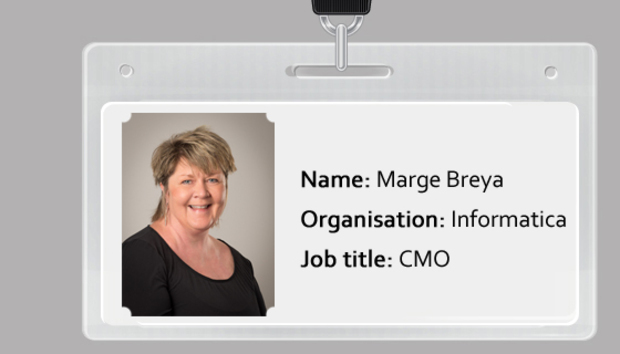 Business Objects, SAP, Oracle, BEA, Sun, HP… Informatica CMO Marge Breya’s CV reads like a list of Silicon Valley royalty so it seems pretty obvious to ask her why she has alighted at Informatica, a respected company, certainly, but not, on the face of it, one of the great stars of the Valley scene nor a company operating in a trendy area. Breya, a straight-talking lady from Chicago who appears to know everybody worth knowing, corrects me in a trice when we meet in London at the company’s user conference. First, the data integration layer where Informatica mines its seams is a fast-growing category, she says, and the big target is to be a $3bn-plus, top 10 software company. Secondly, for a CMO, companies that have around $1bn in revenue are the Land of Opportunity and her aim is to spend smartly, quintupling social spend and partnering with the right people like Salesforce.com to generate positive, viral energy about Informatica and the integration opportunity. Third, she’s a data junkie, as many marketers need to be today, so the fit between a data company and data marketing appeals. Breya has form here, as you might expect. She led marketing activities when Business Objects (later to be swallowed by SAP) and BEA (grist to the Oracle mill, eventually) were at a similar stage. “As companies hit $1bn they’re about to go mainstream and it’s a huge opportunity… and I’m a little in love with data,” she says. It’s an attitude that means she’s unlikely to be lulled into the appeal of “big advertising” like roadside billboards. “Highway 101 is done for the employees, not for the customers,” she says, referring to the famous road that skirts San Francisco and adding that every $70 spent that way adds up to $1 in benefit. The confluence between marketing, digital tools and self-service IT is causing shenanigans in companies today, of course. So much so that some studies even suggest CMOs will spend more on IT than CIOs by 2017. However, Breya says the truth will be more complex with a web of mutual and related interests getting involved in buying ICT tools. An ideal state will see marketers and ITers who are data-savvy and can therefore speak on equal terms, Breya adds. Unusually for a CMO, Breya’s knowledge encompasses both the ‘yin’ of marketing and the ‘yang’ of engineering in perfect balance. She trained as an engineer and says she was a “process-type person” who discovered she liked “mixing it up”. She was later recruited into running technical PR accounts for an ad agency through an old acquaintance. That led Breya into temporary CMO roles and later at Sun Microsystems to a key role pushing the Sun Netscape Alliance at a time in the late 1990s when Sun was providing the hardware for the dotcom movement and Netscape the software. Ed Zander, one of the leading marketers of his generation, led marketing for Sun at the time and was an influence. The CMO role in technology is, if anything, going to become even more interesting, Breya believes. The way Breya sees it, there will be a “college of hard knocks” where we all learn the new rules of the game and where policies and lobbying will, for a time, be all over the place. At the same time, the CMO role will become even more reliant on data collection and interpretation tools. In an age where understanding the vagaries of Marketo, Salesforce.com and Adobe/Omniture is key, it will be crucial to create models for cross-correlation through tools like Lattice Engines to score and prioritise leads and power predictive apps, Breya says. The standards of reporting that were deemed good enough for the last generation are no longer enough and, to that end, Informatica has employed its first data scientist in marketing to make more sense of raw data and get a grip on deal size, ability to execute, likelihood of closing and when deals will complete. That all takes technological know-how for a CMO to get the most out of the numbers. That digitisation and the increase in hard numbers being generated is also bringing into question the value of brand marketing. That same progress is also giving CMOs the cudgels to justify their spending and Breya says CMOs need to benefit from this and to gauge CEO attitudes to marketing when considering jobs. In short, marketing can longer be patronised as a soft or fluffy activity. An experienced campaigner, Breya knows that marketing can be prone to changes in tack when new bosses come in and that all strategies and messages have an end-date. She notes the way companies evolve, at first describing their abilities in their taglines and only later gaining the confidence to tell buyers what they get from the deal. But she says she loves the role.